Today, Intel is introducing their 64-layer 3D TLC NAND to the enterprise SSD market with the new Intel SSD DC P4510 NVMe drive. They are also finally giving us a chance to test the Virtual RAID On CPU feature introduced with the Skylake-SP and Skylake-X processors last year. Intel has provided four 2TB P4510 SSDs to test against the 8TB model, plus the much sought-after VROC Premium hardware key to unlock the full range of NVMe RAID features on this platform. 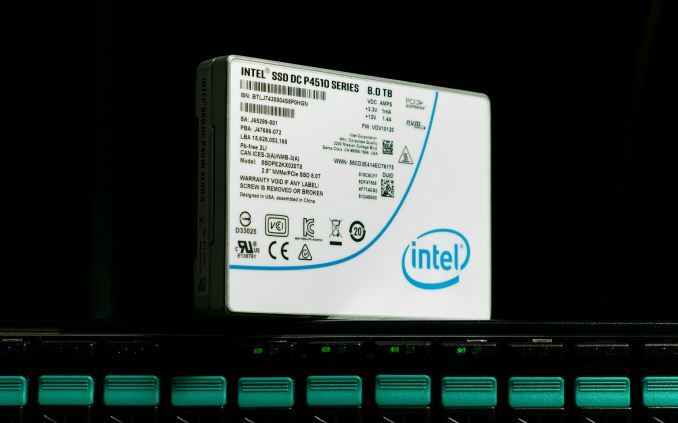 The Intel SSD DC P4510 is Intel's first enterprise SSD to use their 64-layer 3D NAND flash memory. The P4510 uses the same second-generation Intel NVMe SSD controller as the other P45xx and P46xx drives introduced last year with 32-layer 3D NAND. With the Optane SSD DC P4800X now covering the highest product segment, Intel's flash-based enterprise NVMe drives are now divided into just two performance and endurance tiers. The P4510 falls into the cheaper tier of drives with much lower write performance and write endurance ratings that are generally between 0.5 drive writes per day (DWPD) and 1 DWPD. The DC P46xx tier has write endurance ratings around 3 DWPD (and the Optane SSD DC P4800X is rated for 30 DWPD). 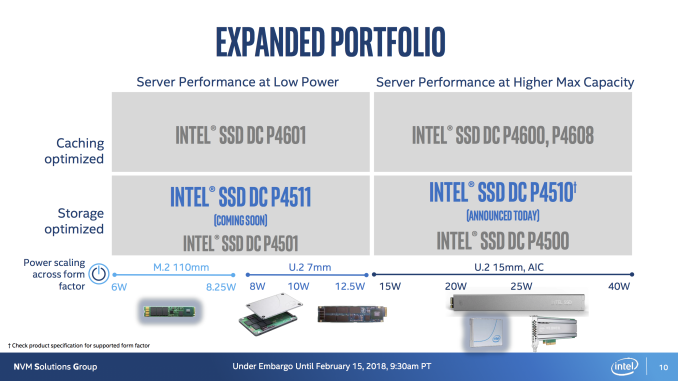 Intel regards the P45xx tier of products as intended for high-capacity primary storage usage, while the P46xx drives are targeted for use as a cache layer. 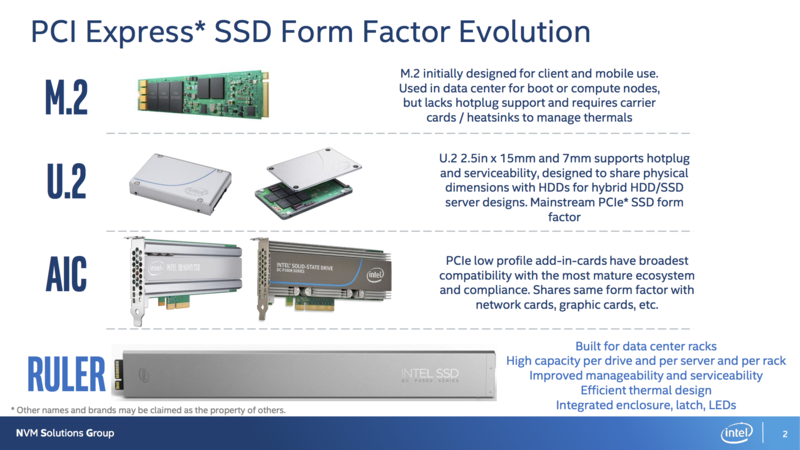 With their second-generation NVMe controller, Intel is also dividing their enterprise NVMe SSD family on another axis. Unlike the controller used on the P3xxx series, new controller is small enough to fit on a M.2 card, and can operate within the power limits of that form factor. A month after first announcing the P4500 and P4600, Intel introduced the low-power P4501 as their first M.2 drive with an in-house controller. The P4501 is also available as a 7mm thick U.2 drive, compared to the 15mm thickness of the high-power U.2 drives. The P4510 falls into that high-power category, but the smaller capacities are rated for just 10W active power, which is comparable to the 2.5" version of the P4501. Compared to the Intel SSD DC P4500, the biggest performance gains the P4510 brings are to write speeds. Random write performance is more than doubled, and sequential write performance is 60-90% higher. With those performance increases and the reduced power consumption, the Intel claims the P4510 offers twice the performance per watt on some workloads. Intel has also tuned the P4501's firmware to offer much better quality of service. A major part of this is that the P4510 is better about prioritizing read operations over flash program or erase operations, leading to an order of magnitude improvement in 99.99th percentile read latency. The P4510 also benefits from the 64L 3D TLC's flash program latency, which is about half that of Intel's 32L 3D NAND. While today marks the first official announcement of the P4510, the 1TB and 2TB capacities started shipping to some large cloud providers in 2017. New today are the 4TB and 8TB models, and the full line will be more broadly available starting this quarter. With a broad range of capacities, and lower prices and higher performance enabled by the transition to 64L 3D NAND, Intel is expecting the P4510 to be their best-selling SSD this year. For now, the P4510 is only available as a 2.5" U.2 drive, but in the future Intel may introduce other form factors, including EDSFF—the now-standardized version of the Intel Ruler concept. We have only had a few days to play with the Intel SSD DC P4510 and Intel VROC, so the benchmark results in this review are very limited. This review focuses solely on the performance of the P4510 and the scalability limits of Intel VROC. Follow-up reviews will provide our usual in-depth analysis of single-drive performance and power efficiency as compared against other enterprise NVMe SSDs, compare VROC performance between Windows and Linux, and VROC performance with an Optane cache. We will also test VROC with our client SSD test suite and Samsung 960 PRO consumer SSDs. >Is Intel VROC really software RAID? I would think any raid system has software to drive - it maybe on say an ARM microcontroller - but it still has some kind of software to make it work.